This livery cupboard consists of a two plank top with some old splitting and a moulded edge of superb patina. This leads down to an early 17th century top rail with 'lunette' carved decoration with 17th century carved applied mouldings to either side with floral and foliate decoration leading down to a central carved 16th century Gothic tracery door with arcaded canted panels with carved diamond decoration to either side with superbly carved 17th century bulbous cup and cover supports to the front with carved foliate uprights to the back. Below, the central rail also 17th century with 'nulling' carved decoration with carved applied mouldings to each side with superbly carved 17th century bulbous cup and cover supports to the front with carved foliate uprights to the back. 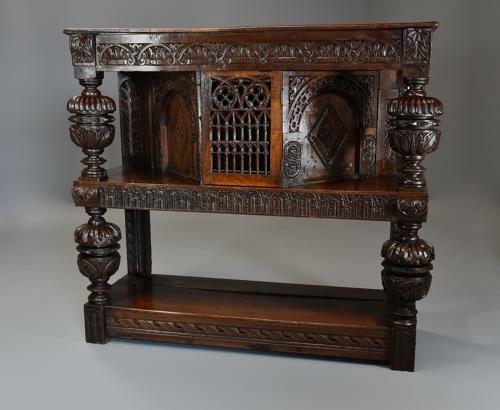 The cupboard is supported on a potboard base with carved front rail, the side rails also consisting of 17th century carvings, the top rail with ‘Guilloche’ carving, middle rail with foliate and ‘lunette’ carving and lower carved rail, the back constructed of old pine boards. The livery cupboard is thought to have been used for household items such as wine and bread and related items such as ewers and basins, the middle section being fully or partially enclosed with either a single door and canted sides or just two doors along the front. This is a superb example of a livery cupboard constructed in the Victorian period with superbly carved pieces – some very good copies were made in the Victorian period, this one being more unusual as it does consist of many 17th century carvings and the 16th century door. This cupboard is in excellent condition for age, is of stable construction and can go straight into a home.